McGowan himself had no doubts about his ability. When asked by Washington Senators first baseman Mickey Vernon, “How could you call [the runner] safe?” McGowan shot back “because I’m the best umpire in the business, I’m number one.”5 After a runner complained that McGowan had called him out at second before the play was over, McGowan replied, “That’s right. Any umpire can call a play after it happens. Only the great ones like me can call ’em before they happen.”6 This, and similar assertions, led to the nicknames “Chesty,” “No. 1,” “Wild Willie of Wilmington,” and “Hot Shot,” often spoken with equal parts praise and scorn. While it is often said that a good umpire is an invisible umpire, such cannot be said about McGowan. He gave his personality free range on the field. He would call a ball a strike to speed up a game or a strike a ball as a favor to a batter. To the astonishment and consternation of managers and coaches, he advised players during a game on their swing, attitude, or what a pitcher might throw them. He received three suspensions, once in the minors and twice in the majors, for displays of temper. McGowan was a tour de force, durable, calling 2,451 games from 1925 to 1940,7 and, in spite of his suspensions, well thought of in the commissioner’s office, earning assignments to eight World Series and four All-Star Games including the first in 1933. McGowan’s contributions to the game went beyond umpiring. Acting as an unofficial scout during his minor-league career, he recommended players, notably Goose Goslin and Bucky Harris, to Washington Senators owner Clark Griffith and others, including Jimmy Dykes, to Philadelphia Athletics owner Connie Mack. Once in the majors, his contract forbade such activities, but, as he told Washington Post sportswriter Shirley Povich, “back in my International League days they didn’t care what we did, and I was always placing young ballplayers. I got a kick out of it.”8 Known for his hilarious sense of humor, he was in demand on the rubber-chicken circuit. He wrote numerous newspaper and magazine articles. Toward the end of his career he founded a school for umpires that endures today. Baseball’s Hall of Fame belatedly welcomed him to its membership in 1992. To McGowan’s surprise, the experience agreed with him to the extent that he gave up aspirations to play second base in the majors in favor of umpiring full time. Misrepresenting his age to Tri-State League President George M. Graham, McGowan worked a few games in that league in 1913. The next year he alternated between the Delaware County (Pennsylvania) League and the University of Pennsylvania. On Graham’s recommendation, he landed a position in the Virginia League in 1915 but only after convincing the league president that at 135 pounds he was big enough for the job. Ed Barrow, president of the International League and later general manager of the New York Yankees, offered McGowan a job as a substitute umpire in the International League in 1916. McGowan also worked in the New York State League that year. From there he moved to the Blue Ridge League in 1917, sat out umpiring in 1918, and returned in 1919 to the International League, where he stayed until 1922. Starting in 1918, McGowan worked in the room where gunpowder was made at the DuPont Corporation for six years. He met his wife, Magdalein P. “Madge” Ferry, in 1918 after a basketball game that he won in overtime with a jump shot. They married that year at the Church of the Immaculate Conception in Elkton, Maryland. The couple had one son, Bill Jr., born in 1919, and raised two children of Madge’s brother Bradford after he was killed at a gas station in Elkton when a man carelessly dropped a lighted match into a can of gasoline.13 Once in the majors, the McGowans made their home in the Washington, D.C., area, living first in the city before buying their first house in Chevy Chase, Maryland, and their second in Silver Spring, Maryland. An umpire’s primary responsibility is twofold – maintaining control of the game and enforcing the rules fairly. McGowan did so with equal parts intimidation, firmness, and humor flavored with an occasional dash of favoritism and flashes of anger. 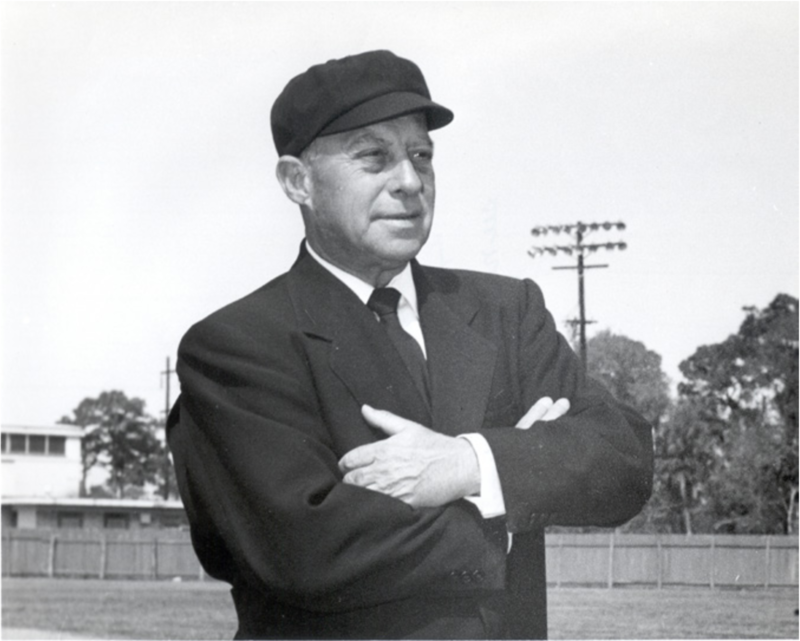 McGowan’s lasting legacy to the game came in the form of a school for umpires he started in 1938 working out of his home in Chevy Chase, Maryland. He conducted classes and practice sessions at the nearby University of Maryland. In 1939 he teamed with fellow umpire Emmitt Thomas “Red” Ormsby to establish a school in Jackson, Mississippi, that they moved later to Florida. The school operated for about one month between January and March of each year in various Florida locations. Thanks to the G.I. Bill of Rights, enrollment swelled to 251 in 1947 with 95 percent of the students being veterans. Many graduates of the school found work in the minor leagues and a few, including John Rice, made it to the majors. The school continues today, after several changes in ownership, as the Harry Wendelstedt Umpire School in Ormand Beach, Florida, offering instruction to women as well as men. McGowan died at his home in Silver Spring on December 9, 1954, of a heart attack brought on from complications in his struggle with diabetes. At his funeral Mass in Silver Spring, conducted by a nephew, Rev. William Buckley, all major-league umpires attended as did American League President Will Harridge, Senators owner Clark Griffith, Senators manager Bucky Harris, former Senators players Joe Judge, Sam Rice, and Ossie Bluege, and active Senators player Jim Busby. Burial was in the family plot in Cathedral Cemetery in Wilmington. 1 Honochick called McGowan "the very best umpire that I ever worked with." Larry Gerlach, The Men in Blue: Conversations with Umpires (Lincoln: University of Nebraska Press, 1994), 183. On page 184 Honochick used the word "superstar." For an in-depth discussion of McGowan’s life and career, see Bob Luke, Dean of Umpires: A Biography of Bill McGowan, 1896-1954 (Jefferson, North Carolina: McFarland & Co., 2005). 3 Bob Luke, “Hall of Famer Bill McGowan Umpired With Vigor and Style,” Baseball Digest, February 2002: 72-75. 4 Bill McGowan, Text Book: Bill McGowan’s School for Umpires (Cocoa, Florida: privately published, January-February 1947), 5. 5 Mickey Vernon, author interview, February 2003. 6 Shirley Povich, “This Morning,” Washington Post, May 30, 1958. 8 Shirley Povich, “This Morning,” Washington Post, May 13, 1938. 9 Newspaper clipping in McGowan’s Hall of Fame file. 10 Don E. Basenfelder, “McGowan, Players’ Choice as Leading A.L. Umpire,” The Sporting News, January 23, 1936: 5. 11 J.G. Taylor Spink, “Series Tops in Thrills, Low in Kicks – McGowan,” The Sporting News, October 14, 1947: 11. 12 Fred Sawyer, “Sox Unable to Hold Big League,” Boston Globe, April 15, 1925. 13 Bill McGowan Jr. author interview, November 22, 2003. 14 Shirley Povich, “McGowan Walked Right In, Threw Ruth Out,” Washington Post, December 10, 1954. 15 Ed Linn, Hitter: The Life and Turmoil of Ted Williams (New York: Harcourt Brace, 1993), 128. 16 Shirley Povich, Baseball Digest, April, 1954: 35. 17 Donald Honig, The October Heroes (New York: Simon and Schuster, 1979), 252. 18 Povich, “This Morning,” Washington Post, May 30, 1958. 19 David Halberstam, Summer of ’49 (Scranton, Pennsylvania: William Morrow & Co., 1991), 217. 20 Lawrence Keating, “Baseball’s Daffy Day,” Coronet, June 1957: 73. 21 Sid Hudson, author telephone interview, February 22, 2003. 22 Doug Gilbert, The Great Delaware Sports Book (Montcharin, Delaware: Manatee Books, 1995), 100. 23 James Carmichael, “Dean of the Men in Blue,” The Sporting News, December 22, 1954: 14. 24 Bill McGowan, Text Book, 13. 25 Bill Gilbert, Buddy Lewis, author telephone interviews, December 15, 2002. 26 Unidentified newspaper article in McGowan’s Hall of Fame file. 27 Oscar Ruhl, “From the Ruhl Book,” The Sporting News, November 5, 1952: 13. 28 Ted Williams as told to John Underwood, My Turn at Bat: The Story of My Life (New York: Simon and Schuster, 1969), 85-86. 29 Shirley Povich, Morning Line, December 10, 1954. 30 Irv Noren, author telephone interview, May 19, 2004. 31 Gil Coan, author interview, March 8, 2004. 32 Bill McGowan Jr., author interview, January 20, 2003. 33 Frank “Buck” O’Neill, “McQuinn, Case Face Operations to Save Careers,” Washington Post-Times Herald, October 17, 1944. 34 “Sports on Television,” Washington Post, October 24, 1954. 35 Francis Stann, “Connolly’s Motionless Call: Old-Time Umps Would Have Been TV Naturals,” Baseball Digest, April, 1954: 63.